Also known as Jungle Park, the Parque Aguilas del Teide is located minutes from Los Cristianos, in Southern Tenerife. This is the only tropical forest in Europe to be home to more than 300 animal species from all over the 5 continents, in around 75,000 m² of jungle. This wonderful zoological park will make you feel as if you were right in the middle of the jungle, thanks to its various hiking paths with tunnels, suspension bridges, waterfalls and caves. 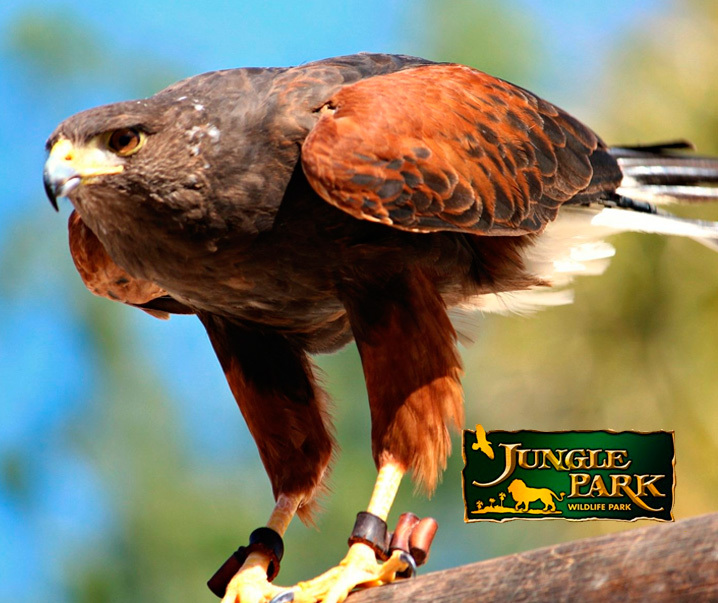 You will be surrounded by a large variety of animal species such as primates, felines, birds of prey, penguins, hippopotamus, reptiles, exotic birds. The white tigers and white lions truly are the highlight of your visit to the park. If you never had the opportunity to see them, don’t miss it! Birds of prey show featuring hawks, vultures, and eagles in free flight, guided by a whole team of experts. Exotic birds show featuring parrots whose pirouettes and balance games will give you a good laugh. Sea lions that will amaze spectators with their agility skills. Jungle Raid features a thrilling circuit with bridges, ropes and tunnels. The Bob is a funny sliding adventure boasting more than 800 meters of tracks (this attraction is not included in the entrance price). The child rate is valid for 5 to 10 years and the mini one for 3 to 4 years. Free entry for children under 3 years old.